This is a contentious question. The game itself is not clear. It never suggests a particular interpretation or even the existence of a single allegorical meaning. Competing theories abound, and creator Jonathan Blow won't talk about any of them except to imply that these are all somewhat off-base or only partially correct. It's a contentious game. Some consider the story to be pretentious, some consider the whole thing pretentious, some consider it the wrong kind of pretentious. Additionally, Jonathan Blow appears to read everything that is written about Braid on the internet, so you can imagine him looking over your breakthrough analysis and shaking his head dismissively. If anyone continues to discuss what Braid might be about, it's because the subject is still largely unresolved. The story in itself is a puzzle, and if Braid does nothing else it reminds you how good it feels to solve the impossible. Behind two doors is a scrap of a painting that you need to collect. The doors are both locked, and there's only one key in the area. This key will open either door, but you can only use it once. If you do the logical thing and unlock the first door, of course you cannot then progress. How frustrating is this? You can't solve it by dexterity. In fact, you cannot solve this by any realistic method. In Braid, though, our world works differently. Braid is not a test of reflexes but of your capacity to rewire your brain to think about the rules of time and physics in entirely unfamiliar ways. Every challenge has specific parameters to observe and unique rules to learn, and is solvable only by these special criteria. Braid needs you to narrow your vision and concentrate. It's like a Magic Eye picture if you could only see the image by scientifically deducing the process by which an autostereogram works, instead of just marveling that you made a dolphin appear. Unlocking both doors is completely beyond normal human ability, but, you think, what if -- and then, in ten seconds, you've mentally rearranged every element and every contradiction of the puzzle into a configuration which briefly made a flash of absolute sense. You've reconstructed time and space to suit your temporary purposes, and who wouldn't feel smart for doing that? That's your eureka moment -- one of about thirty. This kind of gratification is not a reward for one particularly difficult problem in the game. You get this emotional feedback rationed out in evenly-paced doses. This could probably be addictive if each high wasn't also so hard to achieve. Braid is an emotional pendulum that swings between frustrated worthlessness and being hyper-impressed with your own cleverness. Braid creates circumstances which facilitate feelings of momentary genius. Playing Braid, I relate to high school dorks who select steroid-abusing vigilantes as their in-game avatars, except I am role-playing as a smart person. The captain of the debate team or something. The game does its absolute best to ensure you get to feel this way about yourself. There are no variable difficulty levels or in-game hint system. You either solve it and feel good, or you don't. Or you cheat, and Jonathan Blow tries to head that impulse off at the pass. "Some of the puzzles will be hard", he writes in his high-concept official walkthrough. "But when you manage to solve those hard puzzles, you will feel very good about it. The game will feel very rewarding. Don't rob yourself of that feeling by reading a walkthrough!" It's a plea for preserving the sanctity of experience. What would change if you did use a walkthrough? There'd be no such sense of accomplishment, you wouldn't feel smart, and in attempting a solution you would never make a mistake and see the consequences. If you cheat, you miss a lot of what is special about Braid. All of this is relevant because Braid concerns a character who appears to be an actual genius. It's tricky to say who 'Tim' is, exactly, since that's like answering what the game is about. Here's something that he could be, though, at least in one reality: a scientist on the Manhattan Project and working through a series of epiphanies and micro-discoveries that lead to his creation of the atomic bomb, or whatever Pandora's Box that's supposed to represent. Tim is tightly focused on this scientific pursuit to the detriment of his relationship. He is so involved with his work that he doesn't see (or can't see, or doesn't care about) the potential harm to others that his invention might incur. Neither does he recognise the adverse effects that his behaviour is already having on his personal life; we see him indirectly push away a loved one. His obsession diminishes his humanity. 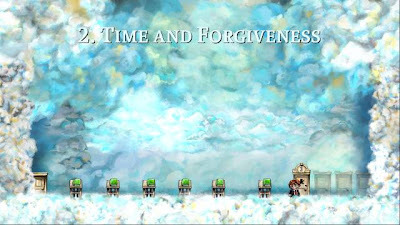 I think that there are deliberate reasons why Braid is difficult, why it's a puzzle game, and why it's a game at all. If it's all three, then it can regularly induce in the player the almost vain feeling of exceptional aptitude. Again, it's hard to say too much about what thoughts go through Tim's mind: by all external appearances he's clinical, overly rational and emotionally hollow. Maybe, though, the reason that he fixates on the challenges presented by his work, and accepts the collateral damage to his relationships, is that solving puzzles makes him feel really good. In playing Braid we feel smart too, and we might sympathise. Developing the atomic bomb must have presented an uncommonly challenging creative exercise. It's as if through the act of playing, you're in Tim's head working through the mental acrobatics and twisting around what we know to be natural and right to arrive at a seemingly impossible conclusion. Tim is probably so divorced from reality that he would abstract nuclear physics and quantum mechanics to the comprehensible immaturity of monsters and keys. Tim operates in isolation, and if he is a person at all, then this is certainly no good for him. The nature of his work means he is thoroughly consumed. 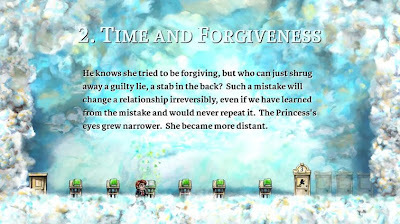 Occasionally he gets tantalizingly close to final confirmation, but, time and again, the Princess is in another castle. He longs to know her at last, and so on. But we understand why he keeps going. He's messing around with things that he shouldn't -- like time -- but he's getting smarter and smarter, so he's fine with this. The sheer intellectual fascination of his task provides him with enough intermittent stimulation for him to continue. Is that the theme of Braid? The price of obsession is the loss of compassion? Playing the game, you too can obsess over the puzzles. You can easily get zeroed in on forcing a solution to work that you don't register the nearby platform that actually does figure into the answer. Puzzles left unfinished stay with you; even after you turn off the game, they run through your mind. Gamers are trained to overcome all obstacles. At the Game Developers Conference this year, an absent exhibitor at the IGF left behind a hastily-constructed jigsaw puzzle of their company logo, cut into a handful of laminated pieces. I saw it and smirked derisively, thinking I could solve that thing in three seconds. I couldn't do it at all. I am still upset about this. Still, you can't screw up your life too badly by tormenting yourself over two locked doors in Braid. This is unless you are actually in the situation of ignoring your spouse to play more of the game, but the events of the game might illuminate you as to your own situation. You would have learned more about your relationship with your significant other from an Xbox Live Arcade game than you ever did in conversation with him or her. 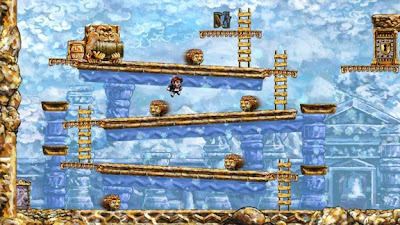 Braid's not a long game and the puzzles aren't really impossible. What aspect, then, could you really hone in on, what holy grail could you really torture yourself over? There's the secret constellation: the game's hidden stars, very much out of the way and, comparatively, a real ordeal to find. Would the reward be worth it putting yourself through that? Would you feel smart, or just exceedingly patient? What if you figured out, conclusively, what Braid was about? What a rush it was to realise the nuclear bomb connection on your own. Imagine that was only the starting point: if you could then produce an absolute interpretation that crystallized every facet of the game into sharp relief. Imagine that it satisfied all questions and met with everyone's approval, even the game's creator. You made Braid make complete sense; you found the Princess. If you were the one to discover the answer, if you were the very first one... God, wouldn't that feel great? Now that the game has been released on the PC, I've also had the opportunity to play it further than the Xbox demo. In short, I consider Braid to be the definite gaming experience of recent years. No ifs, no buts, no clauses. Braid offers about as much fun, joy, discovery, and introspection as is humanly possible to squeeze into one game. The puzzles never overstay their welcome, and they make me feel like a genius for eventually finding a solution. The audiovisual experience is so impressive that I'd be satisfied with Braid even if it consisted of nothing but running through pretty fields with killer bunnies chasing you while vaguely neoceltic folk tunes loop in the background. My only gripe would be that sometimes it is difficult to determine whether your failure is a result of poor execution or a false approach to begin with. To avoid spoilers I won't go into any specific details but this is best seen in the 'bouncing ladder' puzzle in Elevator Action. For some reason I never thought about playing and 'decoding' Braid to be analogous to Tim's single-minded pursuit of his Princess but it does sound reasonable and adds another elliptical layer to Braid's intrigue. The game's text has been decried as bombastic or pretentious but it talks in a language that I understand. I am an engineer. I deduce, I infer, I achieve. Doing that, I sometimes fail to relate to the more subjective cues my friends and family employ. The game leads me to places I recognize from my own personality that I'm not the most proud of. Finally, the themes Braid are not new. Fables of mistakes, regrets, hesitance, pursuit of love or knowledge, etc. have been told since time unknown. In the context of a video game, however, these are very underexplored areas. In my books, Braid's greatest merit is not only that it tackles a lot of criminally neglected yet very resonant themes, it's that Braid does that in a way that is fundamentally rooted in video gaming aesthetics instead of aiming for a 'interactive movie' -experience that is all too common in the FPS genre, for example. This is the language I understand, these are the stones I built my castle from. Thanks for the comment. I appreciated the cookie recipe analogy. I agree with you pretty much entirely, although I'm not an engineer. I enjoyed Braid pretty much unreservedly. The most common concern even among the people who like the game is that the text/story is overblown, but I like all of it. This might not have been apparent from the post I wrote but it's one of my favourite games ever. @ILR said "My only gripe would be that sometimes it is difficult to determine whether your failure is a result of poor execution or a false approach to begin with." I agree. 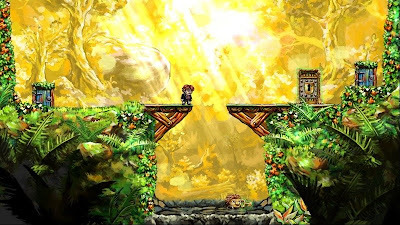 When I did solve the puzzles in Braid (still haven't finished it because I want to avoid walkthroughs and do it myself), I often felt that I did so by accident or fluke. There is the reward of solving the puzzle, but there's no confirmation that I've "gotten it." That's quite different from most games. Hi Duncan this was a really this was a really good piece and also one of the best elaboration of what makes the game's puzzle-solving so satisfying. there's been a so much of discussion of the elliptical narrative (you analysis of which is spot on) and sometimes I think we lose sight of how immensely enjoyable Braid's basic gameplay design is. cheers!